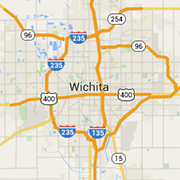 Keep your home clean and tidy with one of the Wichita area's cleaning and maid services. Wichita and South Central Kansas' leader in residential and commercial carpet and duct cleaning services, 24-hour water and fire damage restoration, and janitorial services. Wichita's first-rate house cleaning and decluttering service. Professional organizing gives you more room in your home with a more orderly and balanced appearance. 1 Company... 2 Options... 16,000+ Happy Wichita Customers! Wichita's Premier High-Tech blind cleaning service. We remove, clean, repair and re-install your blinds so they look good as new.